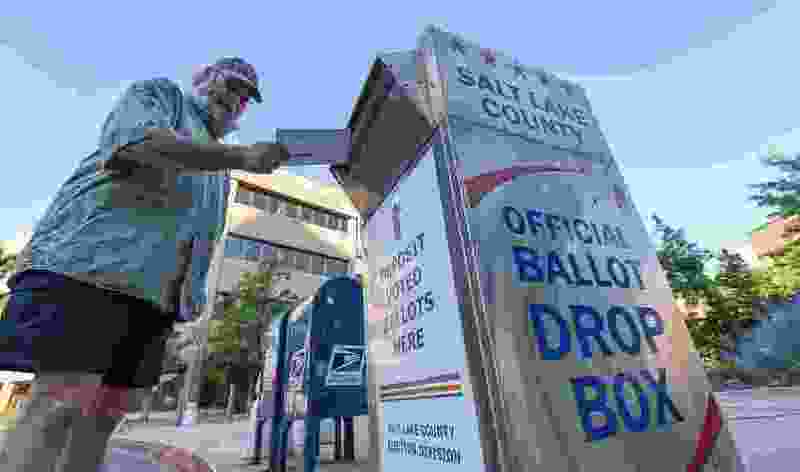 (Francisco Kjolseth | The Salt Lake Tribune) Dave Sawatzki drops his election ballot in the official drop box at the Salt Lake County complex for primary election day on Tuesday, June 26, 2018. There are basically two ways for a state to make its election process more secure and more trustworthy. One is to go super modern and put a lot of money and effort into the latest in cyber security. The other is embrace the retro and use good, old-fashioned, non-hackable paper ballots. Utah, to its credit, is doing both. There can be few things more important to the practice of democracy, to the public’s trust in its own government, than the confidence that, no matter who wins an election, the process was free and fair and the announced results true to the will of the people. Around these parts, making sure the elections are not altered by either the participants or, more likely these days, far-away interlopers, falls to the lieutenant governor, Spencer Cox. Cox is himself an elected official, one who is expected to seek higher office as soon as it is polite for him to do so. The good news about that is that, to all appearances, Cox sees that it is both very much to his political advantage and part of his clearly felt duty to do his best to make sure Utah’s elections are not only clean, but trusted. To that end, the state has already done much to beef up its cyber-security practices — for elections and other functions — doing what can be done to protect all those systems and servers from the “hundreds of millions” of cyber attacks trained on them every day. At the same time, as Cox said the other day, the state is well on its way to making all of its elections into the kind where ballots come to each voter in the mail and are returned by mail or by dropping them off at other designated places. In other words, a cyber-hacker’s nightmare. “We have a paper trail for every vote that is cast in the state,” Cox said. And that may be extra important this year because, as the Lt. Gov. noted, one of the names on this year’s Utah ballot will be Senate candidate Mitt Romney. That’s the same Mitt Romney who, back before it was cool, called out Russia generally, and Vladimir Putin in particular, as the our nation’s biggest foe. Seeing as how it already seems to be Russians who are among the most, if not the most, active hackers of the world’s internet functions, Cox rightly worries that Moscow’s aversion for Romney’s political career could make the whole of the Utah election process a favored target. The Utah Elections Office deserves the backing, financial and otherwise, of the rest of state government and of all Utahns. Some ways we can all help are to take personal responsibility for making sure that we are properly registered, that we pay attention to mailings and announcements from each of our county clerks and that we vote, on time and by the rules, not only as a way of recording each individual choice, but also to make it easier for those running the elections to do their jobs in what may be some of the more difficult circumstances election officials have seen in a long time.